At the end of 2017, I shared with you my own year-end retrospective, a review of my process for accomplishing goals in 2017. And now that it’s midterm for most of us, I thought I’d revisit the retro meeting as a way to do a process review of your activities and even those of your current courses. 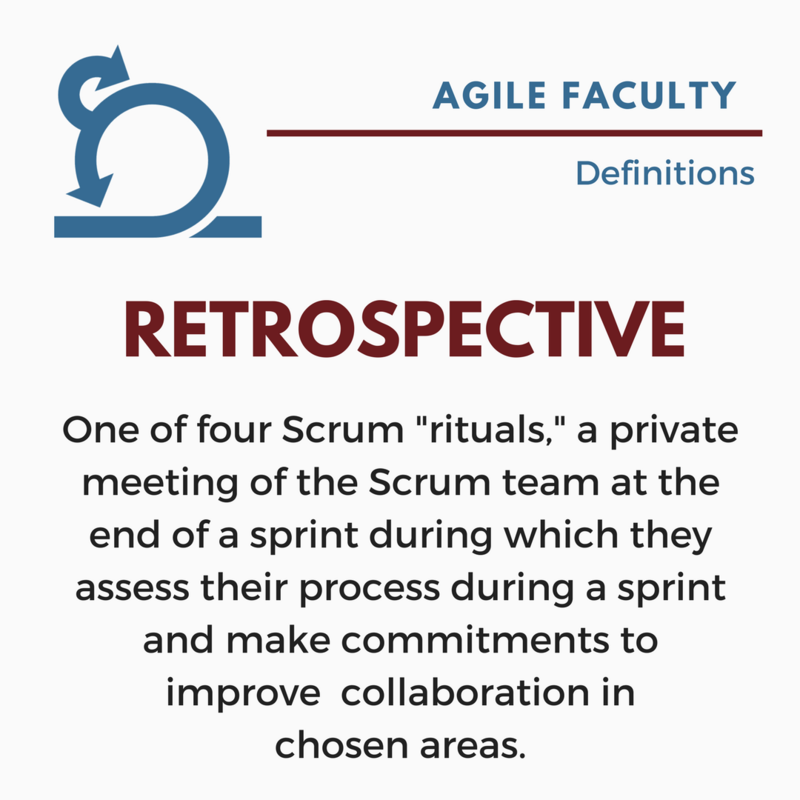 The retrospective is the fourth meeting of the Scrum cycle, the last one before planning for the next sprint. The team and Scrum Master gather and review their team process during the finished sprint. They talk about how well they collaborated, what they could have done better or differently and how they will improve the team in the coming sprint. They might compare their actions over the sprint to goals they set for themselves previously or to a vision statement or team charter they created previously. However they frame the meeting, it’s about process and only process. It’s fitting that this is a private meeting of the team. Remember the Scrum values – focus, commitment, courage, respect, openness – these have to start with the team themselves. The retro is one of the places in the framework that these values are honestly discussed in terms of how and how well they were manifested in the sprint. During the first pilot of the Design Thinking Studio in Social Innovation, we taught the students to do retrospectives in their project teams, once using the starfish activity (right) and once using a scaled-down version of the “run the boat” activity (below). Each asks the team to brainstorm the good, the bad, the average about their teamwork during the sprint, then to visualize it in some way. The starfish categories are pretty straightforward. 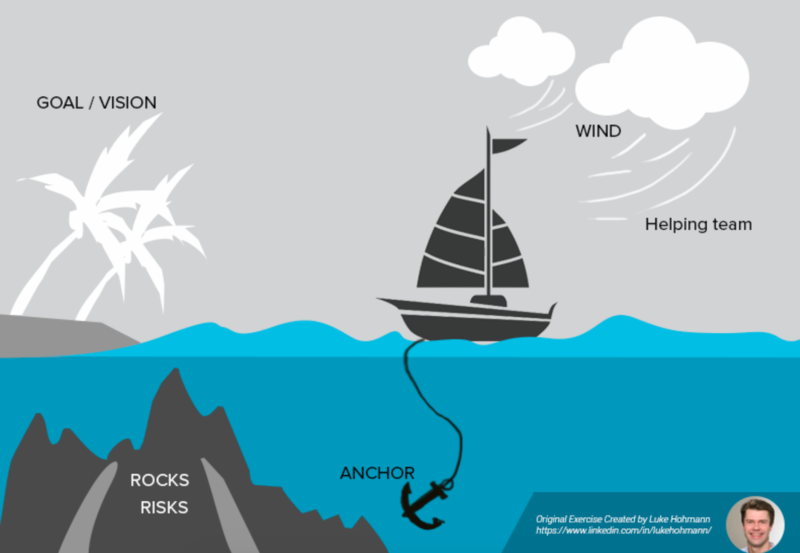 The sailboat categories are a little more creative, but the metaphors are useful. How might you use retros? If you have your students do longer group projects, have them do a retro mid-project and at the end. 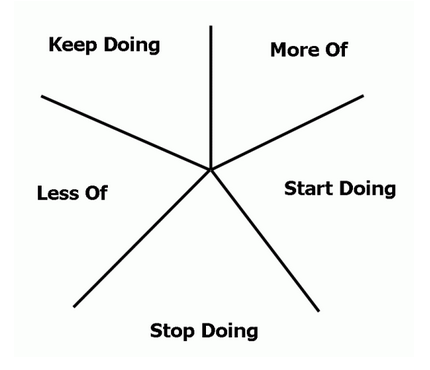 This helps to remind them that process is just as important to work as the ultimate product. You could also do this with a research team or committee to refocus on the values of focus, commitment, courage, respect, openness. The students in the first Studio pilot did something that surprised us last year, but it was powerful and something I want to do in future courses or leadership roles. Because the first semester was a true pilot in every sense of the word, we were playing by ear most of the time. And that was frustrating for all of us in different ways at different times. After we taught the students do a retrospective in their project teams, they asked if we could do the same activity, all of us, for the program itself. This was, in all honesty, scary for me because I don’t like verbal conflict and I knew the students were frustrated while I was doing my best to create a good experience under the circumstances. So we all did the starfish retrospective activity, students and faculty alike brainstorming ideas and concerns on individual sticky notes before compiling them into the appropriate categories. While it was still stressful because of the potential for conflict to bubble over, the activity was extremely valuable. We were all able to share pros and cons using the language of the activity without singling people out for criticism. It allowed the faculty to better explain some things that were truly out of our control and places where we shared their critique. It allowed students to productively articulate frustration and contribute to the solutions rather than simply venting and potentially hurting feelings. We used this experience to reset the program as best we could, but it helped build further trust and respect that was needed. You might consider doing a midterm retrospective in one of your courses, letting students share their experiences and suggestions. You might also try this with your research team if conflict is rising or with your department/program colleagues to remind everyone that focus, commitment, courage, respect, openness are part of the experience of working together that have to be built, tended to, and sustained. But importantly, if you do a retrospective, collaborative agree on what everyone will work to do better next to continue to improve the experience for everyone. The action after is almost more important than the retro itself. I’d love to hear from you if you’ve tried retros and how it went!